Pop culture is part of our heritage. The challenge is to raise the stakes and add to its legacy instead of recycling it. Co-founded by French journalist David Benaym and Performer Danny Tidwell (American Ballet Theatre, So You Think You Can Dance, Memphis on Broadway…), Movmnt Magazine aspires to bridge the gap between pop culture and today’s real talent, and recognize artists over fame junkies. We aim to bring fashion, dance, music and pop culture, together as a lifestyle. 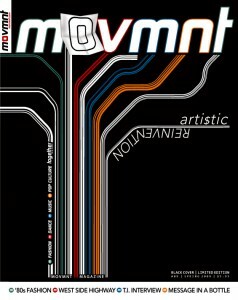 Movmnt™ Magazine is a quarterly publication printed in Vermont, USA on post consumer recycled paper. Movmnt™ magazine is a member of Green America’s Green Business Network™. Members of Green America share ideas, resources, and support for creating a truly green economy. Movmnt™ (BIPAD 01020)* is a trade mark of e-maprod Inc. Copyright movmnt magazine 2008 – All rights reserved. Do not copy print publish on or off line any text or illustration, photography or reproduction of the pages of the magazine without the authorization of the publisher. You can request permission by sending an email via the feedback form of this website. The name movmnt written with no “e” is the property and trademark of e-maprod Inc, any use of this name will lead to juridical pursuits by the publisher.